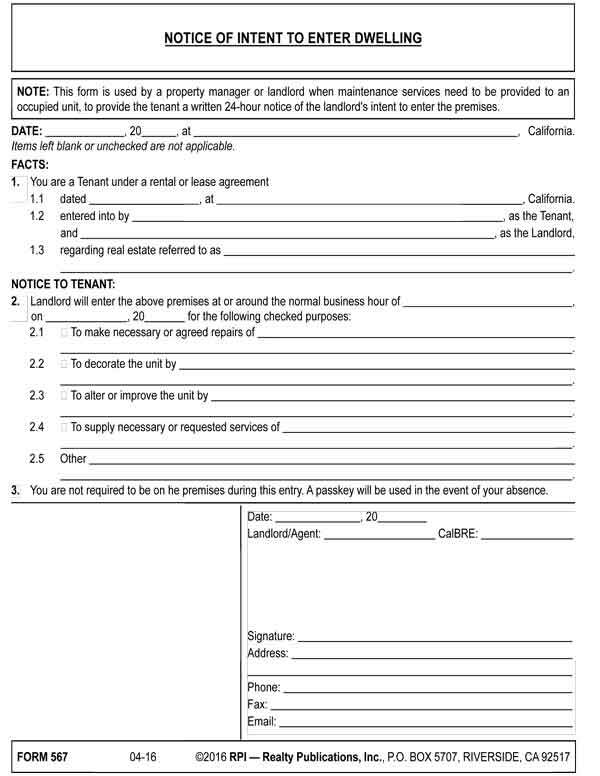 This form is used by a property manager or landlord when maintenance services need to be provided to an occupied unit, to provide the tenant a written 24-hour notice of the landlord’s intent to enter the premises. A landlord’s right to enter a residential or commercial unit during the period of the tenant’s right of occupancy is severely limited. The possessory rights to exclusively occupy the property have been conveyed to the tenant and are no longer held by the landlord, until a reversion of possession occurs on termination of the tenancy. any other cost and expense incurred due to the displacement. Form updated 04-2016 to include the Form Description at the top, white header/footer convention and RPI branding. Form navigation page published 04-2016. Recent Case Decision: Is a notice of inspection to be sent to a tenant after they instruct the landlord to submit all communications through their attorney?